Find and compare the best prices from a range of well known car rental companies at Tenerife North Airport. This is a free to use facility, enabeling you to book direct with the company quoting the price. 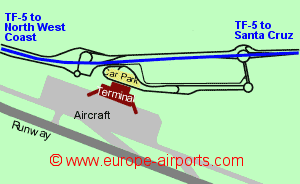 Tenerife North Airport, otherwise known as Airport, is located 11 km west of the capital Santa Cruz de Tenerife, in the north of the Canary island of Tenerife. Bus every 30 minutes most of the day to Santa cruz for 3 Euros or Puerto del Santa Cruz for 5 Euros (the two are in opposite directions). A bus service also connects to Tenerife South airport at a cost of 10 Euros. 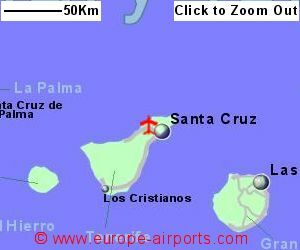 Taxi to Santa Cruz approx 20 Euros, Puerto de la Cruz approx 35 Euros, Tenerife South Airport approx 80 Euros. Facilities include 7 bars/cafes or restaurants, 7 shops, 1 bank/currency exchange, 3 ATM's, free WiFi Internet access and a VIP lounge. 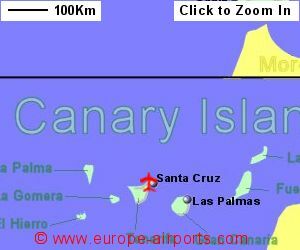 Passenger throughput was 4.7 million passengers in 2017 (an increase of 11% from the previous year) and is mostly used for connecting Tenerife with Mainland Spain and the other canary islands.Sorry but we do not have any details of flights from the UK or Ireland to Tenerife North Airport.